Sierra Leone, officially the Republic of Sierra Leone, is a country in West Africa. The name Sierra Leone was adapted from the Portuguese name for the country: Serra Leoa. The literal meaning is "Lioness Mountains." During the 1700s Sierra Leone was an important center of the transatlantic slave trade. The capital Freetown was founded in 1787 as a home for enslaved Africans who had fought for the British in the American War of Independence. From 1991 to 2002, the country suffered greatly under the devastating effects of rebel incursions. To end rebel activities, UN and British forces disarmed 17,000 militia and rebels in the largest UN peacekeeping act of the decade. While the fighting has ended, Sierra Leone remains impoverished. Though it is rich in mineral resources, there are wide disparities in wealth distribution. Sierra Leone is located on the west coast of Africa, north of the equator. With a land area of 27,699 sq. mi (71,740 sq km), Sierra Leone is bordered by Guinea to the north and northeast, Liberia to the south and southeast, and the Atlantic Ocean to the west. There are a wide variety of ecological and agricultural zones to which people have adapted. Starting in the west, Sierra Leone has some 250 miles (400 km) of coastline, giving it both bountiful marine resources and attractive tourist potential. This is followed by low-lying dense mangrove swamps, rainforested plains and farmland, and finally a mountainous plateau in the east, where Mount Bintumani rises to 6,390 feet (1,948 m). The climate is tropical—hot and humid—with two seasons determining the agricultural cycle: the rainy season from May to November, followed by the dry season from December to May, which includes harmattan, when cool, dry winds blow in off the Sahara Desert. The national capital Freetown sits on a coastal peninsula, situated next to Sierra Leone Harbor, the world's third largest natural harbor. This prime location historically made Sierra Leone the center of trade and colonial administration in the region. 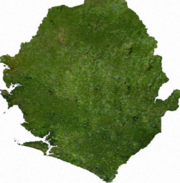 Archaeological findings show that Sierra Leone has been inhabited for thousands of years. Traditional historiography has customarily presented it as peopled by successive waves of invaders; but the language pattern suggests that the coastal Bulom (Sherbro), Temne, and Limba have been in continuous settled occupation for a long time, with subsequent sporadic immigration from inland by Mande-speaking peoples, including Vai, Loko, and Mende. They organized themselves in small political units—independent kingdoms or chiefdoms—whose rulers' powers were checked by councils. Secret societies, notably the Poro secret society, also exercised political power as well as affected the customs of the country. Portuguese explorer Pedro de Cintra, who visited in 1460, gave the name Serra Lyoa (Lioness Mountains), later changed to Sierra Leone by the British. From the fifteenth century onward, European traders congregated near the site of present-day Freetown, under the protection of African rulers, who welcomed them for the commercial opportunities they provided, exchanging imported manufactured goods for ivory and slaves to be employed across the Atlantic. After the Treaty of Utrecht (1713) ended the War of the Spanish Succession (1701–1714), Spain ceded Gibraltar, Minorca, and Nova Scotia to the British and agreed to give Britain the Asiento, a valuable exclusive contract for the sea-transport of enslaved Africans to North America and the Caribbean islands. Queen Anne's government (1702–1714) sold the exclusive rights to the South Sea Company to cover the costs of its participation in the war. During the American Revolutionary War (1775–1783) enslaved Africans were promised freedom if they sided with the British and many did. A group of freed slaves arrived in Sierra Leone in 1787 to form a settlement. They bought land from local Temne leaders and established the Province of Freedom near present-day Freetown. Many of the settlers died of disease in the first year. A renewed attempt at settlement was made in 1792, when about 1,100 freed slaves landed on the Sierra Leone peninsula and founded Freetown. They were joined by about 500 free blacks from Jamaica in 1800. These settlers were English-speaking, and many were literate and Christian. The new colony was controlled by the Sierra Leone Company, which forcefully held off the Temne while the settlers supported themselves by farming. Muslim traders brought Islam, which became firmly established in the Northern Province and subsequently spread throughout the country. In 1807, Great Britain outlawed the trade of enslaved Africans, and in early 1808 the British government took over Freetown from the financially troubled company, using it as a naval base for fighting the traffic in slaves. The British government, which had profited most from the transatlantic trade in captured Africans, now undertook a key role in the suppression of the trade. Between 1808 and 1864, approximately 50,000 liberated Africans settled at Freetown. Protestant missionaries were active there, and in 1827 they founded Fourah Bay College, where Sierra Leoneans were educated and became active as missionaries, traders, and civil servants along the Sierra Leone coast and on Sherbro Island, as well as in other regions in West Africa, especially among the Yoruba people. During the periods of 1821 to 1827, 1843 to 1850, and 1866 to 1874, British holdings on the Gold Coast (now Ghana) were placed under the governor of Sierra Leone. In 1863, an advisory legislative council was established in Sierra Leone. The British were reluctant to assume added responsibility by increasing the size of the colony, but in 1896, the interior was proclaimed a British protectorate, mainly in order to forestall French ambitions in the region, and the Colony and Protectorate of Sierra Leone was established. 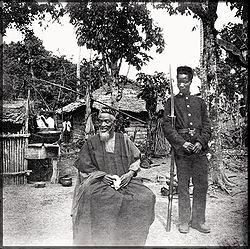 Bai Bureh, when a prisoner at Sierra Leone in 1898. The protectorate was ruled “indirectly” (through the rulers of the numerous small states, rather than by creating an entirely new administrative structure) and a hut tax was imposed in 1898 to pay for administrative costs. The Africans protested the tax in 1898 and fought the British. The uprisings, led in the north by Bai Bureh and in the south by Kai Londo, started in 1896 and lasted over two years. Bai Bureh was finally captured on November 11, 1898 and sent into exile in the Gold Coast, while his comrades were hanged by the British. Under the British, little economic development was undertaken in the protectorate until the 1950s, although a railroad was built and the production for export of palm products and peanuts was encouraged. After World War II, Africans were given more political responsibility, and educational opportunities were enlarged. In the economic sphere, mining (especially of diamonds and iron ore) increased greatly. The Creoles of the colony, who had been largely excluded from higher government posts in favor of the British, sought a larger voice in the affairs of Sierra Leone. A constitution adopted in 1951 gave additional power to Africans. However, the Creoles were a small minority in the combined colony and protectorate, and in the elections of 1951 the protectorate-based Sierra Leone People's Party (SLPP), led by Sir Milton Augustus Margai (a Mende), emerged victorious. On April 27, 1961, Sir Milton Margai led Sierra Leone to independence from the United Kingdom and became the first prime minister. He died three years later and was succeeded by his brother, Sir Albert Margai, who was accused of favoring the Mende tribe. After an election in 1967, Siaka Stevens, candidate of the All People's Congress (APC) and mayor of Freetown, was declared the new prime minister. Coups and counter-coups ensued until Siaka Stevens was reinstated as prime minister. The following years were marked by considerable unrest, caused by ethnic and army disaffection with the central government. On April 19, 1971, Parliament declared Sierra Leone to be a republic. Siaka Stevens, then prime minister, became the nation's first president. Guinean troops requested by Stevens to support his government were in the country from 1971 to 1973. Parliamentary elections were held in 1973; Stevens' APC party won 74 seats and the opposition SLPP party won 15 seats in parliament. An alleged plot to overthrow Stevens failed in July 1974. The leaders of the unsuccessful coup were tried and executed, and in March 1976, he was elected without opposition for a second five-year term as president. In 1978, a new constitution was adopted, creating a one-party state; the 1978 constitution made the APC the only legal political party in Sierra Leone. Siaka Stevens, who had been president of Sierra Leone for 18 years, retired from that position in November 1985, although he continued his role as chairman of the ruling APC party. In August 1985, the APC named the commander of the military forces, Maj. Gen. Joseph Saidu Momoh, Stevens' own choice, as the party candidate to succeed him. Momoh was elected president in a one-party referendum on October 1, 1985. A formal inauguration was held in January 1986, and new parliamentary elections were held in May 1986. Following an alleged attempt to overthrow Momoh in March 1987, over 60 senior government officials were arrested, including First Vice-President Francis Minah, who was removed from office. In October 1990, President Momoh set up a constitutional review commission to review the 1978 one-party constitution with a view to broadening the existing political process, guaranteeing fundamental human rights and the rule of law, and strengthening and consolidating the democratic foundation and structure of the nation. The commission, in its report presented January 1991, recommended reestablishment of a multiparty system of government. Based on that recommendation, a constitution was approved by Parliament in July 1991 and ratified in September; it became effective on October 1, 1991. Corruption within the government and mismanagement of diamond and mineral resources were the main reasons civil war broke out in Sierra Leone. With the breakdown of all state structures, complemented by the effective suppression of all civilian opposition, wide corridors of Sierra Leonean society were opened up to the trafficking of arms and ammunitions. Drugs also eroded national and regional security as well as facilitated crime. In addition to these internal tensions, the brutal civil war going on in neighboring Liberia played a role in the outbreak of fighting in Sierra Leone. Charles Taylor, the then-leader of the National Patriotic Front of Liberia (NPFL), reportedly helped form the Revolutionary United Front (RUF) under a former Sierra Leone army corporal, Foday Sankoh. Sankoh had met Taylor in Libya in the 1980s, during guerrilla training, and the two men quickly established a relationship. In return for helping Sankoh, Taylor was rewarded with diamonds from Sierra Leone. On March 23, 1991, the RUF, led by Sankoh and backed by Taylor, crossed from Liberia and attacked villages in the Eastern Province. The government was unable to put up significant resistance. Within a month, the RUF controlled much of the Eastern Province. The rebels were quick to demonstrate their brutality toward the civilian population; the forced recruitment of child soldiers was also an early feature of the rebellion. On April 29, 1992, a group of young military officers led by Capt. Valentine Strasser, apparently frustrated by the government's failure to deal with the rebels, launched a military coup, which sent President Momoh into exile in Guinea and established the National Provisional Ruling Council (NPRC) with Col. Yahya Kanu as its chairman. Kanu was assassinated by unknown gunmen shortly after he took office. Strasser eventually took over as chairman of the NPRC. The NPRC proved to be nearly as ineffectual as the Momoh government in repelling the RUF. More and more of the country fell to RUF fighters, so that by 1995 they held much of the countryside and were on the doorsteps of the capital. The NPRC hired several hundred mercenaries. Within a month they had driven the RUF back to enclaves along Sierra Leone’s borders. In January 1996, after nearly four years in power, President Strasser was ousted in a coup led by his minister of defense, Brigadier Julius Maada Bio. Promises of a return to civilian rule were fulfilled by Bio, who handed power over to Ahmad Tejan Kabbah, of the Sierra Leone People's Party, after presidential elections in early 1996. Kabbah's government reached a cease-fire in the war with RUF; rebel terror attacks continued, however, apparently aided by Liberia. On May 25, 1997, a group of military officers led by Maj. Gen. Johnny Paul Koroma overthrew Kabbah. They established the Armed Forces Revolutionary Council (AFRC). Koroma suspended the constitution; banned demonstrations; abolished political parties; shut down all the country's private radio stations; and invited the RUF to join the government. The United Nations imposed sanctions against the military government in October 1997, and the Economic Community of West African States (ECOWAS) sent in its forces, led by Nigeria. Clashes between the rebels and ECOWAS troops in the capital forced 12,000 Freetown residents to flee. In February 1998, ECOWAS troops drove the rebels out of Freetown, and President Kabbah was returned to office on March 10, 1998. However, rebel forces remained firmly in control of the Northern Province, the Kono diamond field, and areas along the Liberian border. In January 1999, over 6,000 people were killed in fighting between ECOWAS troops and the rebels in the Western Area. In March, Nigeria announced it would withdraw its forces by May. A peace accord was signed in July between President Kabbah and Foday Sankoh, leader of the RUF. The agreement granted the rebels seats in a new government and a general amnesty from prosecution. The government had largely ceased functioning effectively, however, and at least half of its territory remained under rebel control. In October, the United Nations agreed to send peacekeepers to help restore order and disarm the rebels. The first of the 6,000-member force began arriving in December, and the Security Council voted in February 2000, to increase the UN forces to 11,000 (and subsequently to 13,000). In May, when nearly all Nigerian forces had left and UN forces were attempting to disarm the RUF in the Eastern Province, Sankoh's forces clashed with the UN troops and some 500 peacekeepers were taken hostage as the peace accord effectively collapsed. An 800-member British force entered the country to secure Western Freetown and evacuate Europeans; some also acted in support of the forces fighting the RUF, including Koroma's AFRC group. After Sankoh was captured in Freetown, the hostages were gradually released by the RUF, but clashes between the UN forces and the RUF continued, and in July the West Side Boys—part of the AFRC—clashed with the peacekeepers. In the same month, the UN Security Council placed a ban on the sale of rough diamonds from Sierra Leone in an attempt to undermine the funding of the RUF. In late August, senior RUF commander Sam Bockarie became head of the RUF; also, British troops training the Sierra Leone army were taken hostage by the West Side Boys but were freed by a British raid in September. General elections scheduled for early 2001 were postponed, due to the insecurity caused by the civil war. In May 2001, sanctions were imposed on Liberia because of its support for the rebels, and UN peacekeepers began to make headway in disarming the various factions. Disarmament of rebel and pro-government militias proceeded slowly and fighting continued to occur. By January 2002, most of the estimated 45,000 fighters had surrendered their weapons. As disarmament progressed, the government began to reassert its authority in formerly rebel-held areas. In a ceremony on January 18, 2002, President Kabbah declared the civil war officially over. An estimated two hundred thousand people were killed; a further two million people were displaced in neighboring countries; and thousands of people had their arms or legs hacked off by rebels by the time the war ended. Presidential and parliamentary elections were finally held in May 2002. President Kabbah was reelected, gaining 70 percent of the vote, and his Sierra Leone People's Party won a majority of the parliamentary seats. The Sierra Leone government asked the United Nations to help set up a Special Court for Sierra Leone, which would try “those who bear the greatest responsibility” for the commission of war crimes and crimes against humanity during the civil war. On January 16, 2002, the UN and the government of Sierra Leone signed an agreement establishing the court. In March 2003 the Special Court for Sierra Leone issued its first indictments. Foday Sankoh, already in custody, was indicted, along with notorious RUF field commander Sam "Mosquito" Bockarie, and Johnny Paul Koroma, leader of the AFRC, among several others. On May 5, 2003, Bockarie was killed in Liberia, allegedly on orders from President Charles Taylor, who feared Bockarie’s testimony before the Special Court. Johnny Paul Koroma was also rumored to have been killed, though his death remains unconfirmed. Two of the accused died while incarcerated. On March 25, 2006, with the election of Liberian President Ellen Johnson-Sirleaf, then-Nigerian President Olusegun Obasanjo permitted transfer of Charles Taylor, who had been living in exile in the Nigerian coastal town of Calobar, to Sierra Leone for prosecution. Two days later, Taylor attempted to flee Nigeria, but he was apprehended by Nigerian authorities and transferred to Freetown under UN guard. Taylor is now being held in The Hague, where he awaits trial before the Special Court on 11 indictments of war crimes and crimes against humanity. In a dramatic upset, Kabbah's chosen successor as president, Vice President Solomon Berewa, lost both the presidential and parliamentary elections in 2007 to the opposition All People's Congress (APC). The APC's candidate, Ernest Bai Koroma, was sworn in as the new president after being declared the winner of the runoff election by 54.6 percent to Berewa's 45.4 percent. Koroma is seen by observers as having benefited from the government's failure to deliver social services. Sierra Leone is a constitutional republic with a directly elected president and a unicameral legislature. The president is the head of state, the head of government, and commander-in-chief of the armed forces. The president appoints and heads a cabinet of ministers, which must be approved by the parliament. The president is elected by popular vote to a maximum of two five-year terms. The president's power is checked by the House of Representatives. The parliament is unicameral, with 124 seats, of which 112 are elected concurrently with the presidential elections; the other 12 seats are filled by paramount chiefs from each of the country's 12 administrative districts. All members serve five-year terms. The Sierra Leone judicial system consists of the Supreme Court, Court of Appeals, High Court of Justice, and magistrate courts. The president appoints and parliament approves justices for the three courts. Local elections were held in 2004 (for the first time since 1972), electing 456 councilors sitting in 19 local councils. The Republic of Sierra Leone is composed of three provinces and one area; the provinces are further divided into twelve districts. Other major cities in the country include Kabala, Port Loko, Magburaka, Waterloo, Kailahun, Bonthe and Kambia. Sierra Leone is a member of the Economic Community of West African States (ECOWAS); the United Nations; the African Union (AU); and the Organization of Islamic Conference. Sierra Leone, along with Liberia and Guinea, formed the Manor River Union (MRU). The Manor River Union is primarily designed to implement development projects and promote regional economic integration among the three nations. Sierra Leone has maintained cordial relations with the West, in particular with former rulers, the United Kingdom. Sierra Leone also maintains diplomatic relations with China, Libya, Iran, and Cuba. Sierra Leone is an extremely poor nation with tremendous inequality in income distribution. While it possesses substantial mineral, agricultural, and fishery resources, its economic and social infrastructure is not well developed, and serious social disorders continue to hamper economic development. Nearly half of the working-age population engages in subsistence agriculture. Manufacturing consists mainly of the processing of raw materials and of light manufacturing for the domestic market. Alluvial (surface) diamond mining remains the major source of hard currency earnings, accounting for nearly half of Sierra Leone's exports. Much of Sierra Leone’s formal economy was destroyed in the country’s civil war. Since the cessation of hostilities in 2002, massive infusions of outside assistance have helped it begin to recover. Much of the recovery will depend on the success of efforts to limit official corruption, which many feel was the chief culprit for the country’s descent into civil war. A key indicator of success is the effectiveness of government management of its diamond sector. Agriculture accounts for 52.5 percent of national income. The government is trying to increase food and cash crop production and upgrade small farmer skills. Mineral exports remain Sierra Leone's principal foreign exchange earner. Sierra Leone is a major producer of gem-quality diamonds. Though rich in this resource, the country has historically struggled to manage its exploitation and export. Annual production estimates range between $250-300 million. However, not all of that passes through formal export channels, although formal exports have dramatically improved since the days of civil war. The balance is smuggled, where it is possibly used for money laundering or financing illicit activities. Efforts to improve the management of the export trade have met with some success. In October 2000, a UN-approved export certification system for exporting diamonds from Sierra Leone was put into place that led to a dramatic increase in legal exports. In 2001, the government created a mining community development fund, which returns a portion of diamond export taxes to diamond mining communities, to raise local communities' stake in the legal diamond trade. Despite its successes and development, the Sierra Leone economy still faces some significant challenges. There is a high rate of unemployment, particularly among the youth and ex-combatants. Authorities have been slow to implement reforms in the civil service, and the pace of the privatization program is also slacking. With other foreign investors hesitant to move in, the Chinese have done so eagerly and now are operating in every sector of the economy. The Chinese government donated a fisheries patrol boat. Sierra Leone’s currency is the Leone (Le). The central bank of the country is the Bank of Sierra Leone, which is located in the capital, Freetown. The Bank of Sierra Leone is a 100 percent state-owned corporate body. Sierra Leone has an estimated population of just over six million people, the majority being children and youth. Freetown, the national capital and largest city, is the commercial and educational center of the country. Other major cities in the country include Bo, Kenema, Koidu, and Makeni. Although English is the official language spoken in schools and government administration, Krio (a language derived from English and several African languages and native to the Sierra Leone Krio people), is the de facto national language spoken throughout the country. It is widely spoken among all the tribes in Sierra Leone. The population of Sierra Leone is comprised of about 16 ethnic groups; each with its own language and customs, the two largest of these being the Mende and Temne, about equal in numbers and representing 60 percent of the country's population. The Mende predominate in the Southern Province, the Temne in the Northern Province. The third largest ethnic group is the Limba, representing about 9.5 percent of the population. Like the Temne, the Limba are mostly found in the Northern Province. The Krios (descendants of freed slaves who came to Freetown from the West Indies, North America, and Britain) make up 3 percent of the population, but their language is spoken throughout Sierra Leone. Most Krios live in the Western Area, particularly Freetown. Other minority ethnic groups in the country include the Sherbro, Kuranko, Mandinka, Kissi, Loko, Fula, Kono, Susu, Yalunka, and Vai. About 2 percent of Sierra Leoneans are of Nigerian or Lebanese descent; the ancestors of the latter fled Lebanon in the late nineteenth century. The average life expectancy at birth of a Sierra Leonean is 38 years for males and 43 years for females. Sierra Leone has one of the highest maternal mortality rates in the world, nearly 200 times higher than in developed countries, according to the United Nations children’s agency UNICEF. The country, which is still recovering from war, ranks second to the last on the UN Human Development Index, just above Niger—a desert country with far fewer resources than diamond- and gold-rich Sierra Leone. Furthermore, one in six babies dies at birth. "These figures are driven by a fatal mix of poverty, ignorance, and poor health provision," said Médecins Sans Frontières (MSF; known in English as Doctors Without Borders) in its report released in 2007. Sierra Leone has an education system with six years of primary school (grades 1–6), and six years of secondary school (grades 7–12); secondary schools are further divided into junior secondary school (grades 7–9) and senior secondary school (grades 10–12). Education in Sierra Leone is offered in private schools and government-sponsored public schools. Primary schools usually start from ages 6 to 12, and secondary schools usually start from 13 years and above. The country's two main universities are Fourah Bay College in Freetown, founded in 1827, and Njala University, founded in 1963. Fourah Bay, established to train missionaries and teachers, is the oldest university in sub-Saharan Africa. Technical institutes and vocational schools are available throughout the country. The majority of Sierra Leoneans are Muslim. According to the International Religious Freedom Report 2007, pproximately 60 percent are Muslim; 20 to 30 percent are Christian, and 5 to 10 percent practice indigenous and other religious beliefs. There are small numbers of Baha'is, Hindus, and Jews. The Sierra Leone constitution provides freedom of religion and the government generally protects this right and does not tolerate its abuse. Unlike many other countries, the religious and tribal mix of Sierra Leone rarely causes religious or tribal conflict. Logging, mining, and slash and burn, deforestation for alternative land use—such as cattle grazing—have produced a dramatic decrease of forested land in Sierra Leone since the 1980s. Until 2002, Sierra Leone lacked a forest management system due to a brutal civil war that resulted in tens of thousands of deaths. On paper, 55 protected areas covered 4.5 percent of Sierra Leone as of 2003. The country has 2,090 known species of higher plants, 147 mammals, 626 birds, 67 reptiles, 35 amphibians, and 99 fish species. In June 2005, the Royal Society for the Protection of Birds (RSPB) and Bird-life International agreed to support a conservation-sustainable development project in the Gola Forest in southeastern Sierra Leone, the most important surviving fragment of rainforest in Sierra Leone. Deforestation rates have increased 7.3 percent since the end of the civil war. The Sierra Leone constitution guarantees freedom of speech, and freedom of the press; however, the government at times restricts these rights in practice. Dozens of newspapers are published in the country; most of them are privately run and are often critical of the government. Under legislation enacted in 1980, all newspapers must register with the Ministry of Information and pay a sizable registration fee. All major cities in the country run their own radio stations. Inaugurated in 1963, The Sierra Leone Broadcasting Service is the government-run station in charge of television and radio broadcasting in the country. The UN Mission in Sierra Leone operates radio services, broadcasting news of UN activities and human rights information, as well as music and news. Radio Sierra Leone, the oldest broadcasting service in English-speaking West Africa, broadcasts mainly in English, with regular news and discussion programs on several topics. Soccer is by far the most popular sport in Sierra Leone. Cricket, basketball, table tennis, volleyball, tennis, boxing, and track and field are also popular in the country. Several Hollywood films have been produced that relate to Sierra Leone. Steven Spielberg’s film Amistad (1997) is about an 1839 mutiny aboard a slave ship that was traveling toward the northeast coast of America. Edward Zwick’s film Blood Diamond (2006) is about diamonds mined in Sierra Leone, Angola, and Congo, and sold in major diamond cutting centers to finance (and prolong) armed conflicts in Africa. The film is centered in Sierra Leone and portrays many of the atrocities, including the practice of cutting off people's limbs to spread fear and insecurity in the countryside and to gain control over the diamond, gold, bauxite, and rutile mining areas. In literature, Sierra Leone is the setting for Graham Greene's classic novel The Heart of the Matter, which deals with diamond smuggling during World War II. Since the rebel incursion in the early 1990s, a number of books have been written about the "diamonds or minerals for weapons" trade. Writers of note include Ishmael Beah (A Long Way Gone: Memoirs of a Boy Soldier), Abioseh Nicol (The Truly Married Woman And Other Stories), Robert Wellesley Cole (Kossoh Town Boy), Syl Cheney-Coker (The Last Harmattan of Alusine Dunbar), William Conton (Kissimi Kamara), Amadu Yullisa Maddy (No Past, No Present, No Future), and Sheikh Gibril Kamara (The Spirit of Badenia). Hugh Paxton's novel Homunculus juxtaposes the realities of the war in Sierra Leone with a fantasy of the exploitation of the war for the trade in blood diamonds and for the testing, demonstration, and sale by auction of bio-weapons to a select clientele of international arms dealers and mercenaries. ↑ "Country Profile:Sierra Leone". Retrieved October 28, 2011. ↑ "Rebuild Sierra-leone". Retrieved October 28, 2011. ↑ 3.0 3.1 Sierra Leone. The World Factbook. Central Intelligence Agency. Retrieved October 28, 2011. ↑ 4.0 4.1 4.2 4.3 Sierra Leone. International Monetary Fund. Retrieved October 28, 2011. ↑ Sierra Leone; International Religious Freedom Report 2007 U.S. Department of State. Retrieved October 22, 2013. Kaplan, Irving. Area Handbook for Sierra Leone. Washington: U.S. Government Printing Office, 1976. All links retrieved September 17, 2015. This page was last modified on 17 September 2015, at 16:52.